On the 14th (Fri), kick back and relax at Mettam's Pool. Keep things going the next day: kick back and relax at City Beach, then enjoy the sand and surf at Cottesloe Beach, and then admire the natural beauty at Kings Park & Botanic Garden. To see ratings, reviews, photos, and tourist information, read Perth route planner . Prague, Czech Republic to Perth is an approximately 23-hour flight. You can also do a combination of train and flight. The time zone difference moving from Central European Time to Australian Western Standard Time is 7 hours. Traveling from Prague in December, things will get much warmer in Perth: highs are around 35°C and lows about 17°C. Finish up your sightseeing early on the 16th (Sun) so you can go by car to Cervantes. Cervantes is a town in Western Australia off Indian Ocean Drive about 198km north-north-west of the state capital, Perth in the Shire of Dandaragan local government area. On the 17th (Mon), explore the wealth of natural beauty at Nambung National Park. To see other places to visit, reviews, photos, and more tourist information, read our Cervantes trip planner . You can drive from Perth to Cervantes in 2.5 hours. Alternatively, you can take a bus. Finish up your sightseeing early on the 17th (Mon) so you can travel to Dongara. Dongara is a town 351km north-northwest of Perth, Western Australia on the Brand Highway. On the 18th (Tue), stroll through Irwin Heritage River Trail, enjoy the sand and surf at South Beach, and then tour the pleasant surroundings at Dongara Activity Park. For other places to visit, photos, maps, and other tourist information, you can read our Dongara tour itinerary builder site . You can drive from Cervantes to Dongara in 2 hours. In December in Dongara, expect temperatures between 35°C during the day and 19°C at night. Finish your sightseeing early on the 18th (Tue) so you can travel to Geraldton. Geraldton is a coastal city in the Mid West region of Western Australia, located 424km north of Perth.At June 2015 Geraldton had an estimated urban population of 39,825. On the 19th (Wed), take an in-depth tour of Museum of Geraldton, take an in-depth tour of Monsignor Hawes Heritage Centre, then enjoy the sand and surf at Town Beach, and finally pause for some serene contemplation at St Francis Xavier Cathedral. On the 20th (Thu), you'll have a packed day of sightseeing: contemplate the long history of Oakabella Homestead, then take in nature's colorful creations at Greenough Museum & Gardens, and then kick back and relax at Back Beach. To see where to stay, reviews, more things to do, and other tourist information, read Geraldton tour itinerary builder tool . Getting from Dongara to Geraldton by car takes about an hour. In December, daily temperatures in Geraldton can reach 35°C, while at night they dip to 19°C. Finish your sightseeing early on the 20th (Thu) so you can travel to Broome. Start off your visit on the 21st (Fri): stroll the grounds of Japanese Cemetery, then kick back and relax at Reddell Beach, and then enjoy the sand and surf at Roebuck Bay. On the 22nd (Sat), you'll have a packed day of sightseeing: identify plant and animal life at Broome Bird Observatory, pause for some serene contemplation at Catholic Diocese of Broome, and then kick back and relax at Cable Beach. To find ratings, maps, traveler tips, and other tourist information, refer to the Broome online tour planner . Traveling by flight from Geraldton to Broome takes 5 hours. Alternatively, you can drive; or take a bus. In December, Broome is somewhat warmer than Geraldton - with highs of 39°C and lows of 31°C. Finish up your sightseeing early on the 22nd (Sat) so you can travel to Port Hedland. Port Hedland is the second largest town in the Pilbara region of Western Australia, with an estimated urban population of 15,191, including the satellite town of South Hedland, 18 km away. On the 23rd (Sun), don't miss a visit to Koombana Lookout Port Hedland, then kick back and relax at Spoil Bank, then stroll through Cemetery Beach Park, and finally see the interesting displays at Don Rhodes Mining Museum. To find maps, photos, and more tourist information, you can read our Port Hedland day trip planning website . Explore your travel options from Broome to Port Hedland with the Route module. In December in Port Hedland, expect temperatures between 43°C during the day and 30°C at night. Finish your sightseeing early on the 23rd (Sun) to allow enough time to travel to Karratha. Karratha is a city in the Pilbara region of Western Australia, adjoining the port of Dampier. Kick off your visit on the 24th (Mon): see a world frozen in time at Cossack Heritage Trail, get great views at Staircase To The Moon, then get lost in a book at Karratha Public Library, and finally explore the landscape on two wheels at Yaburara Heritage Trail. To find traveler tips, photos, maps, and more tourist information, go to the Karratha journey maker site . Traveling by car from Port Hedland to Karratha takes 3 hours. Finish your sightseeing early on the 24th (Mon) so you can travel to Dampier. Dampier is a major industrial port in the northwest of Western Australia. Start off your visit on the 25th (Tue): explore the wealth of natural beauty at Murujuga National Park. 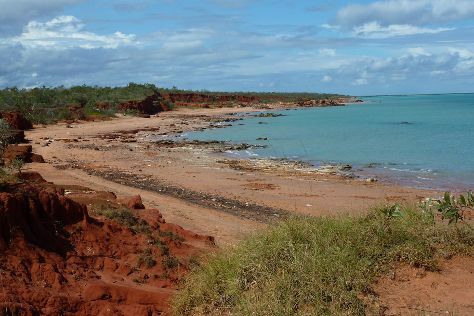 Before you visit Dampier, use our trip planner to discover what you can do and see there. Dampier is very close to Karratha. Finish up your sightseeing early on the 25th (Tue) so you can travel to Coral Bay. Coral Bay is a small town on the coast of Western Australia, north of Perth. On the 26th (Wed), enjoy the sand and surf at Coral Bay Beach and then look for all kinds of wild species at Ningaloo Marine Park. To find more things to do, other places to visit, maps, and tourist information, read Coral Bay trip planner. Traveling by car from Dampier to Coral Bay takes 5.5 hours. Alternatively, you can fly. Finish your sightseeing early on the 26th (Wed) to allow enough time to drive to Exmouth. Exmouth is a town on the tip of the North West Cape in Western Australia. Kick off your visit on the 27th (Thu): see exotic creatures in open habitats at a safari tour and then explore the gorgeous colors at Ningaloo Coast World Heritage Area. On the next day, find your balance on the water with some of the best stand-up paddleboarding in the area, then kick back and relax at Mauritius Beach, and then stroll through Osprey Bay. For other places to visit, maps, reviews, and other tourist information, read our Exmouth trip builder . Traveling by car from Coral Bay to Exmouth takes 2 hours. Alternatively, you can take a bus. In December, daytime highs in Exmouth are 43°C, while nighttime lows are 24°C. Finish up your sightseeing early on the 28th (Fri) so you can travel back home.